Union Agriculture and Farmers Welfare Minister, Shri Radha Mohan today here said that “until the farmers of the country will be prosperous, the development of the country will not pave its way to the right direction. Therefore, agricultural growth is also necessary alongwith industrial development. A better developed future market meant for agricultural commodities will be significant for the farmers. It will facilitate them to obtain fair price of their products. With this system they will face lesser perils related to the ups and downs of prices. In this series such farmers as cannot participate directly in future markets they will also likely to be benefitted as the variation pertained to the timely price fluctuations in the market will be reduced and the farmers will be safer due to the setback prevalent in the market after post harvesting scenario”. Union Agriculture and Farmers Welfare Minister was addressing at the eve of inauguration of 14th Commodity Future Summit organized by ASSOCHAM. 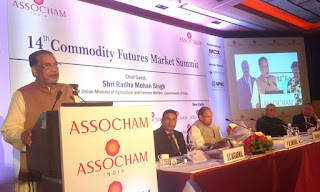 Shri Singh said that “this is good indication for the agriculture arena of the country that ASSOCHAM is taking interest to revitalize agricultural sector by adopting sophisticated techniques so as to improve production in agricultural sector. Today’s conference is meant for exchange views on the topic that how commodity futures market can be conducive for price related balance and perils. At present there are 22 registered markets in India. As you are aware, that India has granted recognizition to three national level multi commodity exchanges. Out of them 1st multi commodity exchange of India (MCX) and 2nd National Commodity And Derivatives Exchange Limited (NCDEX) in Mumbai and 3rd named as National Multi Commodity Exchange India Limited (NMCE) is located in Ahmedabad. There are excellent international leveled methodologies regarding trading, clearing, settlement and governance structure in these markets. In addition to this erstwhile Forward Market Commission (FMC) has recently been merged with SEBI. All commodity exchanges have been placed on regulatory monitoring with the condition applicable for security exchange”. Agriculture and farmers Welfare Minister added that “the tremendous problem related to agricultural field that most of Indian farmers are small and marginal’s and they do not enjoy specific capacity to transect the deals concerned. They deal with their business in low benefitting markets and are victimized to exploitation owing to limited awareness about marketing. A better developed future markets for farmer meant for agricultural commodities attribute to great importance. National Agriculture Market (NAM), a Pan India Electronic Trade Portal is an important measure taken by Central Government in this direction. There will be a single window service for all information and services related to NAM portal APMC. There will also be a provision for the availability of commodities, their price, sale and purchase, related trade offers, to respond the offers pertained to trade along with other services. Whereas the inflow of commodities related to agriculture will be unabated in the markets. Due to online market the cost pertained to transactions will be lesser and transparency concerned will be enhanced. The Cabinet Committee on Economic Affairs (CCEA) has granted a budget of Rs. 200 crore on 1st July 2015 for formulating a NAM portal. Department of Agriculture, Cooperation and Farmers Welfare will impart a grant of Rs. 175 crore for 585 markets during 2015 to 2018”. Shri Singh further added that they have “formulated a interactive farmer portal to provide information to the farmers. It will provide all related information to the farmer in their own language. During this process the farmers can put up their queries and also retort about them. A well developed storage methodology is also important for the success of commodity exchange. Government of India is supporting a plan formulated by Storage Development and Regulatory Authority (WDRA) at existing scenario. There are 949 storages registered with WDRA. Indian farmers are the real face of India. He inspires all approaches being carried out for interest of the farmers”.